Field Trip Factory partners with grocery stores all over the United States and Canada to deliver nutrition education and help kids and families make healthy choices right in the stores. These real-world, hands-on experiences reinforce many common nutrition concepts through game play, interaction with the grocery staff and products, and lively discussion. Each field trip is a unique, engaging way to learn about the food groups, balanced meals, how to be a smart shopper, and more. If you haven’t already signed up for a field trip, make sure you take advantage of the local experiences in your community. To extend the learning, try these 10 ideas that are sure to excite students about nutrition. You might also consider downloading our Pre-Trip and Post-Trip Activity sheets from the Field Trip Factory website that accompany each field trip. Plan a food drive. Students can make a difference and learn about the nutrition found in canned, dried, or nonperishable foods. Consider incorporating a theme into your food drive, such as Farm-to-Table (focusing on items that came from the farm, such as canned corn, green beans, or fruits), Thanks for Giving (a Thanksgiving-themed collection of foods often found around the Thanksgiving table), or Bean Generous (focusing on collecting nutritious dried and canned beans and legumes). Act out or draw a model of a food cycle. Start with the sun and talk about the process of photosynthesis which is essential for plants to grow. Then discuss that animals eat the plants and some animals eat other animals, too. Students can pretend to be the sun, growing plants, and animals. Play a game. Nutrition Bingo is an entertaining way to introduce young students to a variety of different foods and the 5 food groups. Make each column of the Bingo card a different food group. To win, students should mark at least one food from each group. Or run a food relay. Set up an obstacle course. The first student in the relay grabs a card with a picture of a food item on it and runs part of the course before handing the card to the next student. The last student in the relay should place the food card into to the correctly labeled bag – Fruit, Vegetable, Protein, Dairy, or Grains. Invite an expert. It is always fun to have visitors in the classroom. Invite a nutritionist or dietitian to speak with your class about the benefits of a healthy diet and the steps families can take to eat better. Some grocery stores employ dietitians who are willing to visit different groups in the community, so you might start there. Or check with your doctor to get some names of experts. Give students time to prepare a list of questions to ask before the nutritionist or dietitian arrives. Explore traditional foods. With the holidays coming, plan a party featuring traditional foods from different cultures. Choose cultures represented in your classroom, or pick a few cultures that students are interested in learning about. Have students research traditional foods and then bring in or prepare a few of the recipes for the rest of the class to try, avoiding ingredients that students may be allergic to. Or have students give a presentation on the history of the traditional food. Cultivate a garden. Students love getting their hands dirty. 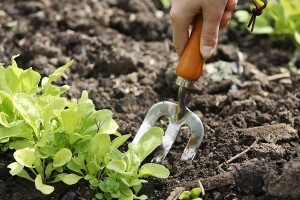 Plant a school or community garden in the spring. Allow students to choose what to grow, plant the seeds or seedlings, and tend the garden throughout the year. Talk about the nutrients found in the fresh foods they are growing. It will be such a reward to sample, bring home, or donate the fruits of their labor in the fall. Think about the lunchroom. Have students look at a school lunch menu and sort the items on the menu by food group. Are all 5 food groups represented each day? Allow students to brainstorm ways to get their fellow students to eat the healthier items at school or how to make school lunches healthier. Be a food critic. Have students bring in a favorite food or dish. Be mindful of food allergies! Provide criteria for students to rate each item and use the criteria to write a review of the food or dish. Create a calendar. Have students research when different fruits and vegetables are in season in your area and then create a calendar stating the best times of the year to eat common and unusual varieties of food. Convert a recipe. Older students can find less nutrition recipes that might be high in fat or sugar and brainstorm ways to make the recipe healthier. Talk about reducing the amount of salt, sugar, or fats in a recipe or substituting entire ingredients without compromising the taste of the dish. Have students prepare the adjusted recipe and bring in samples for the class to taste. Again, please be mindful of food allergies!